In his first start with the Cardinals, Lou Brock gave them a much-needed lift as well as a sample of what was to come with him in their lineup. On June 16, 1964, Brock was in the Cardinals starting lineup for the first time since being acquired from the Cubs the day before. Before getting Brock and pitchers Jack Spring and Paul Toth from the Cubs for pitchers Ernie Broglio and Bobby Shantz and outfielder Doug Clemens on June 15, the Cardinals had lost 16 of their previous 22 games. In a stretch of seven games from June 9 through June 14, St. Louis scored six total runs, losing five times. The Cardinals lost again the night of the Brock trade. Brock arrived in time to pinch-hit in the eighth inning. Jim Owens, a Houston Colt .45s reliever, struck him out on three pitches. Cardinals manager Johnny Keane put Brock in the starting lineup the next day. Playing right field and batting second, between leadoff batter Curt Flood and Bill White, Brock had a superb start, producing a triple, single, two walks, scoring a run and stealing a base in the Cardinals’ 7-1 victory over the Colt .45s at Houston. In the fifth inning, with the Cardinals ahead, 2-0, Brock singled to center against starter Bob Bruce and scored on Ken Boyer’s triple. In the sixth, Brock tripled with two outs against Don Larsen. “Brock just outruns the ball,” Cardinals coach Vern Benson told The Sporting News. Rejuvenated, the win was the first of four in a row for the Cardinals. In his first seven starts for St. Louis, Brock batted .393 (11-for-28). He produced two doubles, two triples, a home run, two walks and three RBI in that stretch, scoring five runs and swiping four bases. Brock was in right field for three of his first five Cardinals starts. After that, Keane kept him in left field for the remainder of the season. Brock made 99 starts in left field and three in right for the 1964 Cardinals. With Brock sparking the offense, creating RBI opportunities for Boyer and White, the Cardinals went on to win the National League pennant and World Series championship. 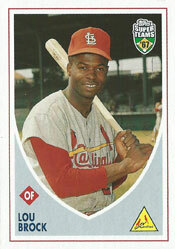 Brock hit .348 and had 33 stolen bases for the 1964 Cardinals. In 103 games, he had 146 hits and scored 81 runs. His .387 on-base percentage was tops on the team.